I don’t remember my first heart surgery. I wasn’t even two years old. It was performed on a cardiologist’s hunch that something “didn’t seem quite right.” A paten ductus arteriosus was discovered and corrected. Almost 16 years later, on another hunch, a different cardiologist performed a trans-esophageal echocardiogram to confirm an atrial septal defect – a hole in my heart. It was my senior year in high school. Although I was an active kid growing up participating in downhill skiing, marching band, and swimming for fun in the St. Croix river. I was never in competitive or team sports and participating in them never really crossed my mind. And then, for some reason, 18 years after my second heart surgery, I decided to do triathlons. My foray into triathlons was not motivated by my own survival, but rather by a friend who needed help bettering her lifestyle. I agreed to train with her for triathlons. I’m not sure what I as thinking as I had never even run a mile. 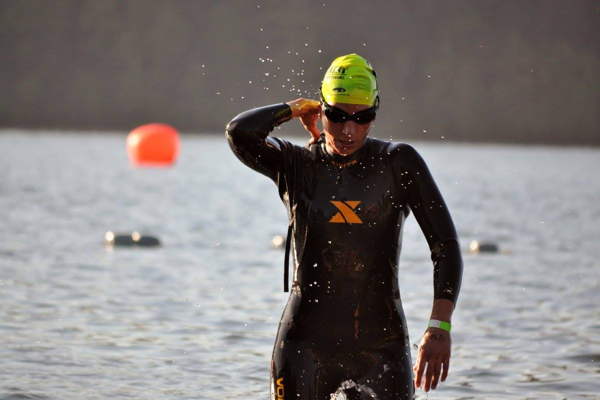 I was a tri-athlete for nearly a year before I saw a Facebook ad from Xterra Wetsuits highlighting the Ironheart Team. I had never thought of triathlon as a platform to raise awareness for congenital heart defects and disease. I never thought this could also be a way to honor the work of my Grandpa, Dr. Richard Varco who was one of the pioneers of Open Heart Surgery. I joined Ironheart that day. Fortunately, I don’t have limitations from my two corrections. I still have a heart murmur caused by a mitral valve prolapse, and every once and awhile I have a heart palpitation triggered by a pulmonary stenosis. These two defects remind me to listen to my body. They are humbling reminders. It’s great to meet new people at races. People are always asking, “What’s Ironheart?” I love the look on their faces when I tell them I am a two-time heart surgery survivor. I can imagine them remembering our conversation the next time they might be struggling during a workout, a race, or just in life. I’m grateful for every day that I can walk to the start line and leap over the finish line. I’m grateful for every stroke in the pool, pedal of the bike, or jog down a path. I’m grateful for that rush of excitement waiting at the starting line and that feeling of relief at the finish. And I’m grateful to Ironheart Foundation for connecting me with wonderful people from all over the world. Reading and hearing about the team member’s stories of survival, successes and struggles remind me to enjoy each moment of my life. In so many ways we seem more than just a team; we seem like family.